We have used the Australia Telescope Compact Array to measure the absorption from the 20 → 3�/sub>E 12.2 GHz transition of methanol toward the z = 0.89 lensing galaxy in the PKS B1830�1 gravitational lens system. Comparison of the velocity of the main absorption feature with the published absorption spectrum from the 10 → 2�/sub>E transition of methanol shows that they differ by �6 � 1.6 km s�/sup>. We can use these observations to constrain the changes in the proton-to-electron mass ratio μ from z = 0.89 to the present to 0.8 � 2.1 � 10�/sup>. 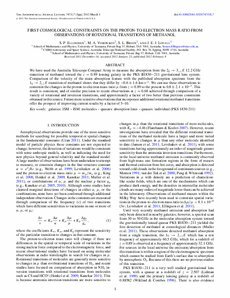 This result is consistent, and of similar precision to recent observations at z = 0.68 achieved through comparison of a variety of rotational and inversion transitions, and approximately a factor of two better than previous constraints obtained in this source. Future more sensitive observations that incorporate additional rotational methanol transitions offer the prospect of improving current results by a factor of 5-10.